High-speed travel through a tube-travel system from St. Louis to Kansas City in 28 minutes is not only possible, a new study says it’s also safe and sustainable. That’s according to a feasibility study conducted by Kansas City engineering giant Black & Veatch. Virgin Hyperloop One is developing the technology for passengers and cargo. According to the company, the hyperloop pod vehicle would accelerate gradually via electric propulsion through a low-pressure tube that glides above track through magnetic levitation at airline speeds. Virgin Hyperloop One had previously ranked Missouri’s route through the I-70 corridor among the top five locations in the world for the high-speed track, and perhaps “top three” the company said in 2018. And now Missouri is the first state to complete a full feasibility report. A company spokesperson released an estimated cost for the Missouri project as between $30 million to $40 million per mile, including the track. That can add up to $10 billion or less for a 250-mile track. Virgin Hyperloop One anticipates that public-private partnerships would fund hyperloop projects like the one Missouri is hoping to achieve. The company claimed its linear infrastructure costs are about 40 percent lower than those seen in high speed rail projects, yet hyperloop delivers two to three times faster speeds. A coalition of groups forming the Missouri Hyperloop Coalition authorized the feasibility study. The groups include St. Louis Regional Chamber, KC Tech Council and the University of Missouri System. Virgin Hyperloop One said the full study will not be released, citing intellectual property issues concerning proprietary technology described in the study. Virgin Hyperloop One released, what it called, “relevant pieces of the report” directly pulled from the study’s executive summary. Backers of the study say it confirms the commercial viability of Virgin Hyperloop One’s technology for the I-70 route based on examination of the social impact, station locations, regulatory issues, route alignments, and rights-of-way. The route would link St. Louis, Columbia and Kansas City. According to the study, the cost to take a hyperloop from St. Louis to Kansas City would be lower than the cost of gas to drive, while cutting down the typical 3 1/2 hour travel time to 28 minutes. Pods would travel at speeds up to 640 mph. Savings for trips to and from Columbia would be approximately 1.5 hours (to 15 minutes). 80% increase in ridership demand for proposed route of 16,000 to 51,000 riders per round trip. Savings from less time spent on the road, adding up to $410 million per year. Reduction in accidents along the I-70, putting up to $91 million per year back in people’s pockets. Additionally, the study highlights how the proposed corridor is very straight and relatively flat, making construction relatively straight-forward and high speeds achievable. Tom Blair, The Missouri Department of Transportation’s (MoDot) St. Louis district engineer, said he originally pitched the I-70 corridor as a viable option for many reasons, including the I-70 right of way is readily available. Concerning the exact location of the track along I-70, Virgin Hyperloop One spokesperson Marcia Christoff explained how the alignment with the interstate lanes would vary. “The hyperstructure route itself is fixed in the sense that it will follow along I-70 between the two cities, St. Louis and Kansas City, but may have to vary in terms of positional configuration,” Christoff said. The “portals” passengers use to board have not been determined. Andrew Smith, Missouri Hyperloop Coalition co-founder, said one near Lambert International Airport has been discussed and seemed to be the preferred location making the most sense for St. Louis. Christoff said if the company were to move forward with the Missouri project, the route infrastructure would be completed by the mid-2020s. The study also reveals the benefits of Missouri’s location being within 500 miles of 43 percent of the U.S. population, 44 percent of all U.S. manufacturing plants, and seven of the top 25 international cargo hubs in the U.S. The route could serve as a central link to an eventual national hyperloop network. In addition to Virgin Hyperloop One’s expressed enthusiasm for Missouri’s feasibility study, Christoff explained that while Missouri is the first-ever state to have completed a full feasibility report, there are other U.S. locations under consideration making progress. Christoff said the company’s engineers are especially excited about Colorado’s project plans because of the landscape and topography of the state. She explained Colorado is in the second half of a feasibility study that is looking at routes to and from Denver International Airport. There will then be a “Phase 2” that then looks at other routes in the state. The Midwest corridor, Pittsburgh-Columbus-Chicago, is in the midst of an Environmental Impact Study (EIS). “Such a study for any transportation system denotes very serious commitment to that proposed system, in our case, a hyperloop project,” Christoff said. 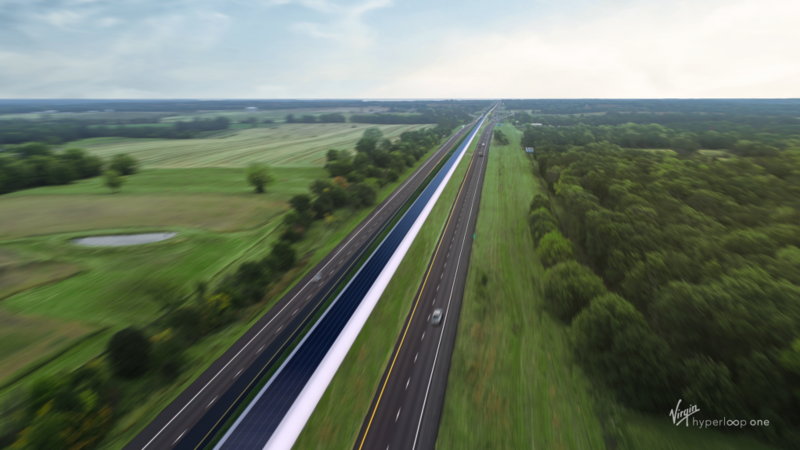 North Central Texas announced in July its intention to undertake an Environmental Impact Study at the “Tier 2 Level” for a high-speed corridor connecting Dallas, Arlington and Fort Worth. “Texas is currently working on a conceptual feasibility study for a longer route from Forth Worth to Laredo,” said Christoff.